One of the things I have attempted to do over the past 25 years is help EAPs see themselves as part of the organization's larger risk management strategy. This is no way conflicts with the touchy-feel (aka, program of attraction) model EAPs depend upon. On the contrary it enhances it. 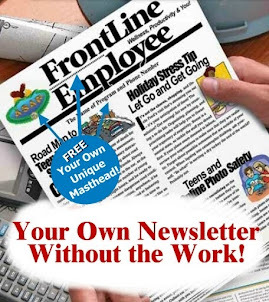 Things like employee newsletters and other utilization and promotion devices are risk management tools and part of the critical continuum of best practices organizations must embrace to reduce loss. And wow are these tools inexpensive. 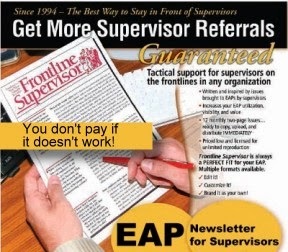 I would like to see more organizations phoning the EAP and saying, "Hey, make sure your renew the employee newsletter, it is probably saving us thousands or millions by increasing your referrals." There are many other tools EAPs can assemble, but this is just one of them. These things are not "nice to haves" as they are often portrayed by uninformed (or misinformed.) Nay, they are essential risk management, and potentially, "going postal" prevention tools. Until recently, I really could not determine why the value-added argument everyone well-understood in the early 1980's was not working better for EAPs, and why instead EAPs service vendors and internal programs were closing faster than a creeping forest fire in Gatlinburg. The idea the EAPs can grow and grow to capture more unmitigated risks associated with human workplace behavior should have overwhelming acceptance by now. I have theory: "The King has No Clothes" . Managed care wants nothing to do with the property-casualty risk market, (which is what we are discussing here), its issues, and the work and integration required to penetrate it. It simple does not meet its business goals of reducing health insurance costs and increasing profits. But EAPs did not start out this way. In yesteryear, they targeted the whole ball of wax of risk in business organizations. If you are retired from the EAP field by now, but as you read this, you know something dramatically degrading has happened to the EAP field. 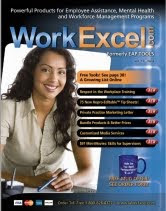 managed care contagion 15 years ago by capturing the high ground and allowing the EAP core technology to work its magic by reaching out into any area of the organization where human behavior and trouble employees became exposures that threatened the financial well-being of the organization. Arlington County/Public Schools now has a six person staff for 7,500 employees and a very healthy budget. No vendor or managed care organization can touch it (many have tried) with the large swath of EAP services it provides. Below is an amazing Web site which contains many arguments and appropriate phraseology for EAPs to use in arguing for their larger purpose, value, and ability to manage more behavioral risks within the confines of the EAP core technology. If you face the ever-present jeopardy of closure and takeover by managed care, you may find help here. Delve deep into it, and start identifying unmitigated risks and exposures during the year. Present an annual "risk mapping report" and recommend additional growth for your EAP, not budget cuts. The successful end result, of course, is more lives saved and more organizational costs contained. Be aggressive with risk management and program growth to help your EAP and the EAP profession itself. It has shrunk 60% in 25 years despite growth in what are called "EAPs." The real story of successful EAPs is still be written, or re-discovered, but it is not one that will sit well with managed care. When it comes to the "lead, follow or get out of the way" approach to the EAP field (as I heard at a recent EAPA conference), be sure the one you are following has clothes.